Western Australia is easily the largest state in the big sunburned country, and within its boundaries are some of Australia's most amazing sights and achievements. Western Australia has more than 12,500 kilometres of coastline, rock formations to rival Uluru, the longest stretch of straight railway in the world, the most productive gold and diamond mines on the planet, and archaeological artefacts that date back 35,000 years. This state is quite a place, which is why you should stretch your itinerary upwards to Broome, out to the Golden Outback and down to Esperance. It's all too good to miss. 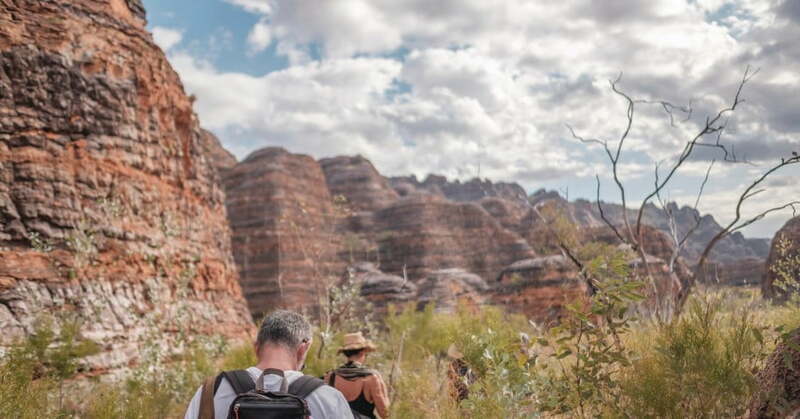 Meet the locals and discover traditional lands, food and cultural practices via Aboriginal tourism experiences in the Australia's North West region. Visit Australia's first 'Campaign with Custodians' sites offering visitors the chance to interact with local communities in Aboriginal lands. Number one in the Broome attractions list is Cable Beach, 22 kilometres of pure white sand and bright turquoise water, with contrasting red ochre cliffs to make the scenery even more intense. The gently rolling waves are ideal for swimming and there's a fossilised dinosaur footprint at Gantheaume Point, which marks the southern end of the beach. How good is that? If you're travelling with kids, they'll be impressed. The ultimate way to enjoy Cable Beach is on camel back in the late afternoon, just as the sun is slipping into the Indian Ocean. Surreal barely describes the experience. Another iconic Broome sightseeing moment happens at night from March to November. When conditions are right, a natural spectacle unfolds at Roebuck Bay. It's called the Staircase to the Moon, because that's exactly what it looks like. The moonlight reflects on the waves to give the impression of steps. It feels like you could walk to the moon and save NASA a lot of trouble and expense. The moonlight reflects on the waves to give the impression of steps. It feels like you could walk to the moon and save NASA a lot of trouble and expense. David Attenborough described the Horizontal Falls near Broome as 'one of the greatest wonders of the natural world'. The 'Horries', as the locals call them, happen in coastal clefts where the McLarty Ranges meet the ocean. The sideways waterfall effect is created as seawater builds up faster on one side of a cleft than the other, creating a waterfall up to five metres high. As the tide changes direction, the direction of the falls reverses, creating whirlpools. It has to be seen to be believed. East of Broome is the Purnululu National Park, a World Heritage-listed area and home to the Bungle Bungle Range. About 350 million years in the making, these mountains look like they were designed by Dr Seuss. They've also been described as 'a packet of half-melted Jaffas'. What's more they're massive, covering around 450 square kilometres. Four-wheel-drive safaris, scenic flights, canyon walks and bush camping are things to do here. The region known as the Golden Outback spreads out from Kalgoorlie-Boulder ('Kal', to the locals), the largest outback city in Australia. If you want desert experiences, the Golden Outback trail won't let you down. In Kalgoorlie itself, the ultimate sightseeing spot is the edge of the Super Pit. You'll look down on a mind-blowing scene of massive mining trucks (that look tiny) winding their way around the curves of a huge hole in the ground. It's quite a spectacle. Not too far from Kalgoorlie, at Lake Ballard, you're in for another jaw-dropping sight. An artist called Antony Gormley has created 51 life-size black steel figures and arranged them on the glittering salt plain. The Golden Outback's most famous natural work of art can be found at Hyden. The Wave Rock formation looks like a huge ocean wave that's just about to break. You can pose as a surfer here and be fairly certain you won't get wet. This outrageous rock is 100 metres long, 15 metres high and more than 2,500 million years old. If you're a golfer, the Golden Outback will give you a round of golf to skite about for the rest of your life. The award-winning Nullabor Links is the world's longest 18-hole par 72 golf course. It's 1,365 kilometres long and runs from Kalgoorlie to Ceduna in South Australia. The concept is 'golf road trip'. While you're driving across the Nullabor on the Eyre Highway, you get to take a break every now and then to complete a hole. Wander through some of the world's most biodiverse landscapes, amount flora found nowhere else on earth.The drive to Esperance and Bremer Bay leads you from outback to coast, through wildflower country so incredibly rich and unique, it's recognised the world over for its biodiversity. Venture deep into the Great Western Woodlands - an area of biological richness considered as internationally significant as Africa's Serengeti. Gaze in awe at Australia's whitest beach at Lucky Bay, and walk among 1,800 beautiful and bizarre species of flowering plants in the UNESCO World Biosphere Reserve of Fitzgerald River National Park. About 2,500 kilometres south of Broome is Western Australia's best kept secret - Esperance. Framed by turquoise ocean and crystalline white-sand bays, this town does its own special brand of beach life. It's so uniquely Australian down here that you can even see kangaroos lounging on the sand. The 40-kilometre Grand Ocean Drive is one of the best things to do in Esperance. No houses, just gorgeous beaches, amazing views and, at certain times, pink lakes. Scientists say the colour comes from a dye created by bacteria that live in the salt crusts. Close to Esperance is Cape Le Grand National Park, where huge granite and gneiss peaks emerge from the coastal plain. The park's beautiful heathlands are home to pygmy possums, grey kangaroos and colourful wildflowers. Your camera app will have a field day here.